water while the Yucaipa Valley Regional Water Filtration Facility was completed. 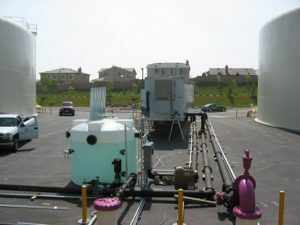 SPI developed and assisted the District with the leasing of a 1 mgd mobile water treatment facility used from 2005 to 2007 in order to treat surface water until the Yucaipa Valley Regional Water Filtration was completed. SPI developed project installation drawings, assisted with facility permitting and start-up and oversaw the performance of the Interim Water treatment facility during its operational period.